Earlier this week, EPI released an analysis of economic performance in Wisconsin and Minnesota since 2010, which showed that by virtually every available measure, Minnesota has outperformed Wisconsin. This is notable because lawmakers in the two states adopted vastly different policy agendas coming out of the recession. Wisconsin adopted a highly conservative agenda of cutting taxes, shrinking government, and weakening unions. Minnesota, in contrast, enacted many key progressive priorities: raising the minimum wage, strengthening safety net programs and labor standards, and boosting public investment in infrastructure and education, financed by raising taxes, primarily on the wealthy. Skeptical readers might argue that as much as the two states are similar, they are sufficiently different such that the diverging economic outcomes observed in our report are the result of fundamental differences in the two states’ economies and that state policy decisions were largely irrelevant. I think there’s ample evidence to indicate that such readers are wrong. In the paper, I discuss some of the policy decisions—such as those around Medicaid expansion, investment in infrastructure, and worker organizing—where one can draw a fairly straight line from the policy decision to the observed economic result. I also note that wage growth was actually stronger in Wisconsin than Minnesota in the seven years prior to Great Recession. It’s also instructive to compare job growth in the two states in the economic expansion prior to the Great Recession. 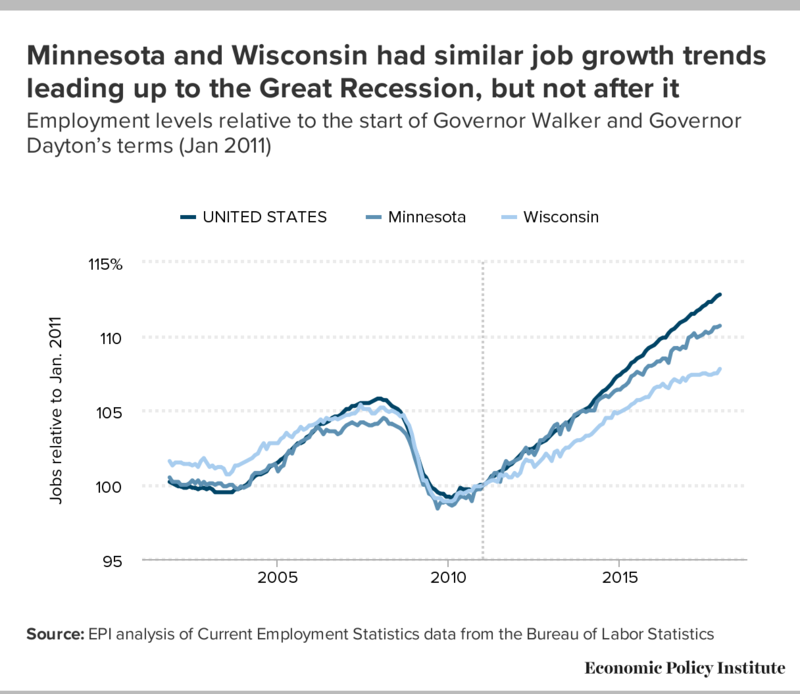 The data suggest that whatever their differences, prior to the recession, Wisconsin and Minnesota followed a very similar trajectory for employment growth. Figure A shows the number of jobs in Wisconsin, Minnesota, and the United States from November 2001 to December 2017, relative to the number of jobs in each geography in January 2011, the month that Governors Walker and Dayton took office. As you can see from the figure, changes in the level of jobs throughout the business cycle leading up to the Great Recession were remarkably similar between the two states. Both Minnesota and Wisconsin had modest job losses in the beginning of the period in the wake of the early 2000s recession, followed by modest job growth that tracked the U.S. average for a while and then flattened out for roughly the last two years prior to the onset of the Great Recession. In that earlier business cycle from November 2001 to December 2007, cumulative job growth was 3.7 percent in Minnesota and 3.3 percent in Wisconsin. Subsequently, the two states suffered losses in the recession that were similar, albeit slightly more severe in Wisconsin—with losses of 4.3 percent and 4.9 percent in Minnesota and Wisconsin, respectively, from December 2007 to December 2010. The period from January 2011 to December 2017, after Governors Walker and Dayton assumed office, shows a starkly different picture. From early on in the recovery, Minnesota’s job growth accelerated noticeably more quickly than Wisconsin’s and the gap between the two states has increased fairly steadily ever since. As I note in the paper, it would take a much more complicated and sophisticated analysis than I have done to pinpoint the precise jobs impact of particular policymakers’ decisions in each state. Nevertheless, I would be willing to bet that Minnesota’s decision to make large public investments in infrastructure, education, and healthcare—including the Affordable Care Act (ACA) Medicaid expansion—early in the latter period likely provided some extra fuel for the state’s economy. Conversely, Wisconsin lawmakers’ decisions to reject federal funding for the Milwaukee-Madison high-speed rail, to reject the ACA Medicaid expansion, and to take an ax to their public sector very likely stifled potential job growth.